Once the NVC receives the I-130 petition from USCIS, they will mail the petitioner a checklist of civil documents that must be mailed or emailed to the NVC with instructions. The checklist will contain a barcode, the NVC case number, and a document cover sheet that must be placed on top of all documents sent to the NVC. Failure to follow the instructions on the checklist when mailing or emailing any documents to the NVC, will make it more difficult for the NVC to identify the case without the case number and bar code, and will thus delay processing of the application. Included with the checklist, the NVC will provide two invoices for the immigrant visa fee and the affidavit of support fee, that must be paid online. The invoices will include specific instructions for paying these fees along with the website. It is very important for the petitioner and beneficiary to be very proactive once they have received notice from USCIS that the application is being transferred to the NVC. It is recommended that if you do not receive any further notices from the NVC by mail or email within 30-45 days of receiving the I-130 approval notice from USCIS, you contact the NVC by phone or email to check the status of the transfer. The NVC representative will advise you accordingly on the length of time that you must wait to hear from the NVC. At times the representative will recommend that you wait 30 additional days, before contacting the NVC. You may also email the NVC to ask if they can send you the checklist and invoices by email. Once the National Visa Center has confirmed that they have received the application from USCIS, the applicant can proceed with the civil document stage. It is recommended that that the intending immigrant file their DS-260 Immigrant Visa Application with the Department of State and pay the appropriate fees on the DOS Consular Electronic Application portal before mailing or e-mailing any documents to the National Visa Center. This way, applicants can streamline the immigrant visa process avoiding unnecessary delays. First, once you have received confirmation from the NVC that they have received your application from USCIS, you must make payment for the immigrant visa fee and affidavit of support fee online according to the instructions provided to you on the invoices. In order to make payment online you must have your NVC case number and invoice IDs. This information again can be found on the instructions provided by the NVC. Second, the applicant must complete and submit the DS-260 Immigrant Visa Application on the Department of State website. Again, the applicant must have their NVC case number to access the application portal. It is very important to answer all questions on the DS-260 truthfully and in good faith. 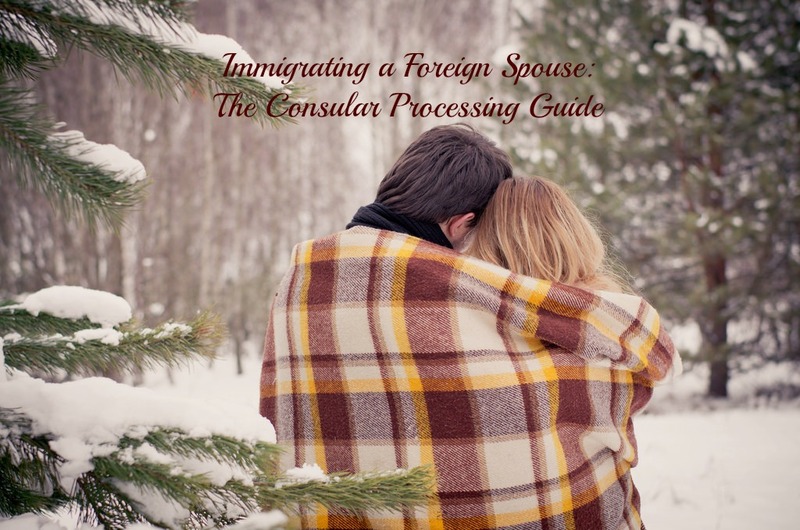 The consular officer that will interview the foreign spouse will review the answers provided on the DS-260. If the officer discovers that the beneficiary misrepresented any information in the DS-260, and/or did not disclose pertinent information, the beneficiary’s application may be denied, or worse they may be subject to a temporary ban from the United States. Once the applicant has submitted the DS-260 they must save a copy of the DS-260 Immigrant Visa Application confirmation page. The applicant will be required to send this confirmation page to the NVC. Once you have made payment for the applicable fees and you have submitted your DS-260 application, you are ready to begin gathering the required Civil Documents that must be mailed or emailed to the NVC to finalize processing of your application. What is the civil document stage? The civil document stage consists of mailing or e-mailing copies of various documents to the National Visa Center so that the NVC can complete pre-processing of the immigrant’s visa application until the case is ready for adjudication at a U.S. Consulate abroad. Once you have submitted your DS-260 Immigrant Visa Application with the Department of State and you have paid the appropriate fees on the portal, all intending immigrants must collect civil documents in support of the immigrant visa application. For family preference categories this will include completing the I-864 Affidavit of Support and gathering supporting financial documents. These civil documents will need to be mailed or emailed to the NVC depending on the prefixes that begin your NVC case number. In order to streamline the immigrant visa application process, the Department of State has designated certain cases to be processed at select U.S. embassies or consulates electronically. If your NVC case number begins with one of the following prefixes you will need to scan and email your civil documents, supporting documents, and translations to nvcelectronic@state.gov including your NVC case number in the subject line and the petitioner’s and beneficiary’s complete names and dates of birth in the body of the email. Attachments must remain below five megabytes. Applicants should submit multiple emails if necessary. For more information about electronic processing please click here. Note: You cannot change a method later on in the application process. NOTE: The NVC has discontinued mailing of original documents. The applicant will submit certified copies or original documents of each required civil document at the time of their interview at a designated U.S. Embassy or Consulate abroad. The civil documents and personal documents that must be submitted to the NVC differ on a country by country basis, for example some documents may not be available depending on the foreign national’s country of citizenship e.g. police records, military records, birth certificates etc. Applicants should review the instructions for their specific embassy or consulate to make sure there are no additional requirements. To review country reciprocity guidelines please click here. In addition, for family preference applicants, the petitioner (U.S. Citizen) must sign and complete Form I-864 Affidavit of Support demonstrating that they have the sufficient finances to support the intending immigrant(s) should they become a public charge. For more information about the affidavit of support and income guidelines click here. Once all civil documents have been mailed to the NVC, it typically takes the NVC 3-4 months to review the information and complete processing of the application, including scheduling of the interview. Once the application has been reviewed, the NVC will schedule the interview, and mail the application package to the U.S. Consular Unit abroad. The applicant must wait to receive an interview notice from the NVC at this time. The interview notice is typically sent by email to the petitioner and beneficiary. The interview notice will outline specific documents the beneficiary must prepare and present at the time of the interview, as well as other instructions including how to schedule the medical appointment, and ASC biometrics appointment. All intending immigrants are required to schedule a medical appointment with an authorized physician in the country where the applicant is to be interviewed. The medical examination and all required vaccinations must be completed before your scheduled immigrant visa interview date. The examination may only be conducted by a physician that is approved by the specific embassy. You may not schedule an appointment with a physician who is not authorized to conduct medical examinations for immigration purposes. The interview notice will contain further information regarding how, when, and where to schedule your medical appointment prior to the immigrant visa interview. You may view U.S. Embassy/Consular specific instructions regarding medical interviews by visiting the DOS website. DO NOT schedule your medical appointment before receiving your interview notice from the NVC. Many U.S. Embassies and Consulates (but not all) require visa applicants to pre-register for courier services and schedule their ASC biometrics appointments online. Pre-registering for courier services and scheduling of the ASC biometrics appointment is done online and must be completed prior to the interview date. Some U.S. Embassies/Consulates take the applicants biometrics at the time of the interview, and do not require the applicant to make an ASC biometrics appointment. Such is the case for Rio De Janeiro, Brazil. Always check the website and interview instructions to determine whether you will need to schedule your ASC biometrics. Most U.S. Embassies and Consulates require visa applicants to pre-register for courier services for the return of passports and immigrant visas to be issued after the interview. By visiting the website indicated above, you may schedule the DHL pickup located for your immigrant visa. Please note that each Consulate has unique entry and security requirements, including whether applicants can bring cell phones into the embassy or consulate. To determine specific requirements for the U.S. Embassy or U.S. Consulate where you will be interviewed please click here. Once you have been approved following your immigrant visa interview, you will need to wait for the courier service to notify you regarding when you can pick up your passport with the immigrant visa inside. In most cases, you will receive a sealed envelope that you must not open. The sealed envelope will be presented to the U.S. CBP officer at the United States port of entry. You will need to provide the officer will this sealed envelope in order to be admitted to the United States. Once you have entered the United States, you will be issued your permanent resident card, and may obtain a driver’s license, SSN, etc. For more information regarding the NVC process please visit our website. For a free consultation please contact our office.